The OpenCar RF-Booster and BiDiB-RF-Basis can be controlled by a DCC input signal or by connecting to the TTL-Serial port. Using the serial connection makes it possible to get the battery percentage, km/h and POM. The rfbooster library uses this serial connection. 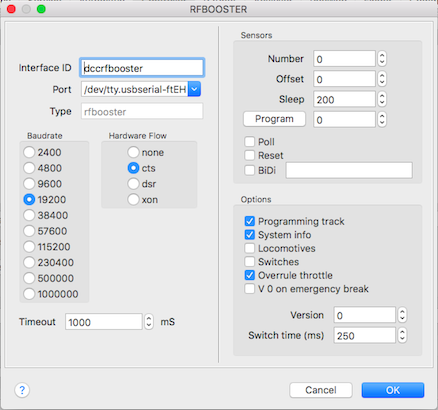 Only the listed parameters are used by the rfbooster library. Unique ID for this controller. The serial port depends of the used operating system. The default baudrate of the RF-Booster is 19200. The default baudrate of the RF-Basis is 115200.